Surah Al Kahf – Never Miss to Recite Surah Kahf on Friday! 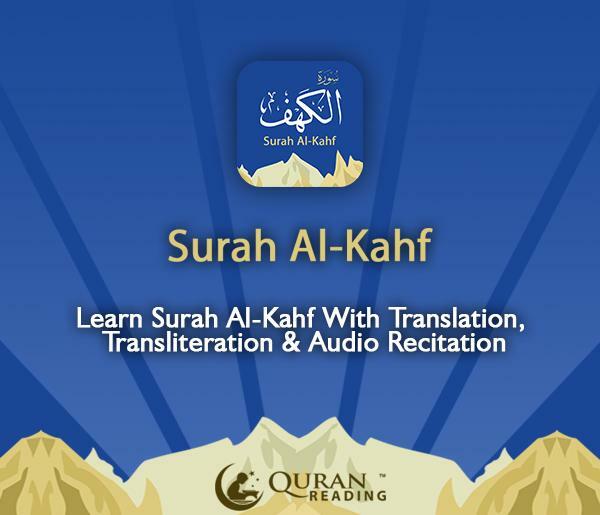 Surah Al Kahf is a knowledge based application with complete recitation, translation, and transliteration developed by QuranReading.com. This app has been developed keeping in view the importance of Surah Kahf for Muslims. Surah Kahf is the 18th chapter of the Holy Quran. Download Surah Kahf now from Google Playstore and iTunes for free and start reading the Surah now. 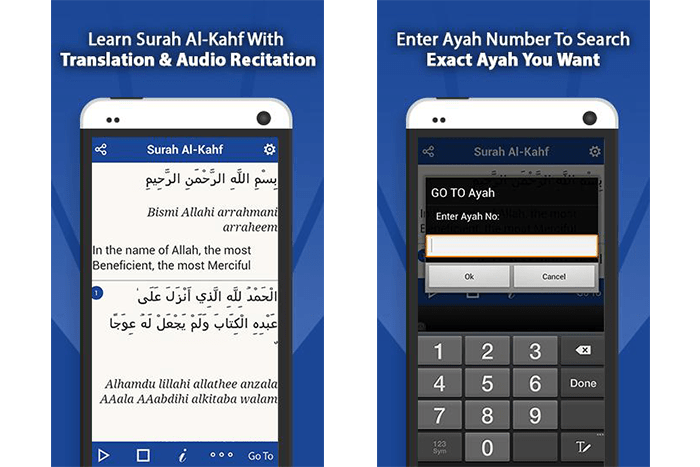 Reciting and listening to Surah Al Kahf on your smartphone anywhere at any time. Translation of Surah Al Kahf in English will help you understand the meaning of Surah. Transliteration of Surah provides support to those Muslims who are weak in reading Arabic. Reciting Surah Al Kahf on every Friday becomes a source of forgiveness of sins committed between 2 Fridays. It is also a means of protection from the fitnah of Dajjal. There are 4 stories of People of the cave, Owner of two beautiful Gardens, Musa and Khizr, and Dhul Qarnayn. These stories carry 4 important lessons, that are: trials of faith, trials of wealth, trials of knowledge and trials of authority in Surah Kahf. Surah Kahf teaches us how to face these trials with humility, sincerity, realistically, choosing good companions, calling to Allah and preparing for the Hereafter. Translation: Translation of Surah Kahf in English is provided in this app. Transliteration: Transliteration of Surah is also featured in Surah Al Kahf. Reciters: Recitation of Surah Al Kahf by 2 famous reciters, Al Afasy and Ghamdi. Customize: Optimization option for font color, font size and background color is available in settings. You can also choose if you want to display translation and transliteration or not. Go to Ayah: Specify which ayah you want to go to by searching ayah number. Surah Al Kahf is a very useful app for all Muslims as it features one of the most read Surahs of Holy Quran. Read Surah Kahf regularly, straight from your smartphone, and benefit from its countless blessings from Allah.